Stellar Kart has the youth camp menu memorized: ham 'n eggs, hamburgers, Sloppy Joes, and typically there's spaghetti in there somewhere. Admittedly, it's not gourmet, but these guys just can't pass up a free meal. Of course, playing music for kids is the real reason behind their camp craze, and new Word Records power pop-punk band Stellar Kart has a mission to connect with youth. "We love camps because we're right there with the kids," says lead guitarist Cody Pellerin. "A lot of bands just want to play shows, which is fine, but I really enjoy using music as an opportunity to relate to youth." Four guys who range in age from 20-24, Stellar Kart is now raring to carry its mission beyond camp borders. With an album title that means "full speed ahead," All Gas. No Brake drives the group's music and message forward, encouraging high schoolers to go all out for God. "They're responsive to our music and lyrics because we just came through that period ourselves," says Agee. "Stellar Kart is definitely geared toward youth group kids because that's where we got our start." Phoenix-based Stellar Kart did indeed start in a youth group. Frontman Agee and drummer Jordan Messer led worship, while bass player Tay Sitera joined them for weekend gigs. Stellar Kart added Pellerin to the line-up about three years ago, and the foursome has since recorded two independent releases, performed about 100 dates each year, and played with bands like Jeremy Camp, By The Tree as well as Seven Places. 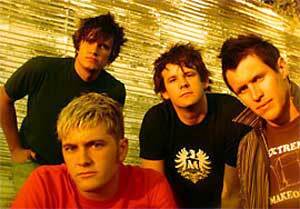 In its early days, Stellar Kart admits to being an Audio Adrenaline tribute band but says that when it wore out Bloom, members began writing their own material. "We got tired of playing the same Audio A songs. We were waiting for them to put out another CD, so we decided to write our own stuff," jokes Agee. Actually, the band has always written its own music. Even now, Messer and Agee take on the lyrics, while all four contribute to the music and arrangements. A self-produced record, All Gas. No Brake features only one worship song, while the other tracks capture Stellar Kart's unique blend of straight-ahead pop-punk. The band's affinity for camp settings is easily heard in "Gone Fishin'" and "Student Driver." Songs written on location, they're full of catchy music with simple messages that are easily understood. In "Student Driver," Stellar Kart uses a fun, rockin' tune to communicate the idea that so many Christians want to be in control, want to be in the driver's seat, but are really just along for the ride.